If you have any questions about our Children's Department or our programs, please speak with Jenn. If you have any questions about our Teen programs, please speak with the Teen Librarian. 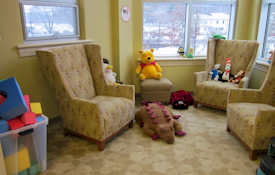 Our Children's Department encompasses the entire second floor of the library. It is home to thousands of books, magazines, DVDs, and audiobooks, as well as a variety of puzzles and board games. We also have a puppet theater and, of course, computers. Our Children's Department is a very pleasant place. It has large windows with lovely views of the river, and there are comfy places to sit and read. Be sure to check it out with your kids next time you visit the Library. Many varied programs and events are offered throughout the year. Some are tailored to specific age groups and grade-levels, while some are programs that all ages will enjoy. Parents are expected to attend activities with children in the youngest age groups. The types of programs offered are constantly changing and evolving as our audience changes and evolves. For information on what programs we currently offer, please see the online calendar, the Library's newsletter, and our Facebook pages, or just come into the Library to find out more about what's going on. Whenever registration is required for any program or event, signups generally begin three to four weeks prior to the program. Some programs fill up very quickly, so it's a good idea to register early. Pre-registration helps us ensure that the program will provide the best experience for your child. 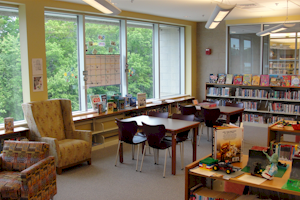 Registration may be done in person or by phone (401-710-7800) during regular library hours. 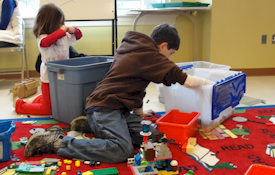 All children's programs will be cancelled if classes in the Burrillville Public Schools are cancelled, even if the library elects to remain open. 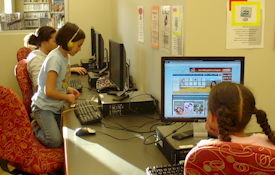 The computers in the JMS Children's Department are available to children 13 years of age and younger, regardless of whether or not they have a library card. Library staff does NOT monitor any child's individual use. 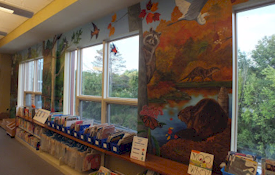 The Children's Department of the JMS Library reminds parents that it is the parents who are ultimately responsible for deciding if and how their children will use the Internet in the public library. Computer use is considered the same as reading a book or magazine or using the Reference collection. As such, parents can NOT ask the library to block their children from using the computers when they are not present. Though there is filtering on the computers, it is by no means perfect. Parents concerned about their children's internet use should be present when their child is using the library computers. Again, library staff does not monitor each child's individual use. 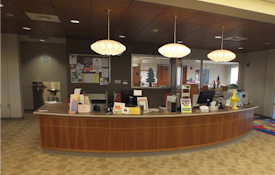 In all departments of the library, children under the age of 10 must always be accompanied by a parent, guardian or responsible caregiver over the age of 13. Parents/caregivers must remain in the building while their children (under the age of 10 years) are attending all organized library programs. If unattended children under the age of 10 are in the library, staff will attempt to contact the child’s parents or caregivers. If this is not accomplished, the police may be called to assist in the situation.